We get asked this question all the time, especially when volatility rears its ugly head. This year's periods of high market volatility are causing clients to ask another question: "How should I act in this environment?" Many investors wonder whether they should ask their portfolio advisors to lower their equity allocations and emphasize either cash or fixed income in their portfolios. This reduction of risk in the throes of a market adjustment can be tempting, but short-term volatility should remind us of the benefits of thinking long-term by creating and following a strategic allocation and resisting the temptation to enter and exit the market according to the ups and downs of its volatility. This is why clients work with us. Smart investors realize they need seasoned, experienced advisors with cold water in their veins and a steady hand on the panic button. As Warren Buffet said, "You only know who is swimming naked when the tide goes out." Our team has seen this before – troubling times make us smile. Smile during bad times, you say? Sure. Because we have a strategy, and we do not get rattled. 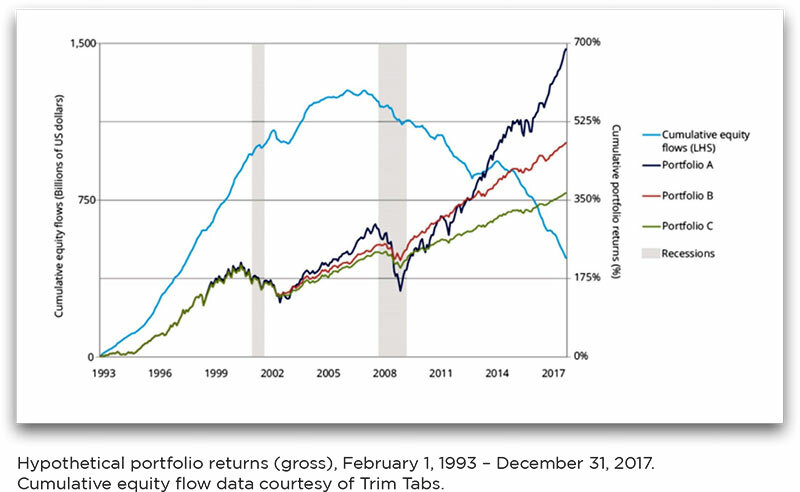 Three very different portfolio strategies are illustrated on the following graph, where the three very different portfolio management approaches are overlaid with mutual fund flows (blue line) from 1993 to 2017 as a catalyst for investor behavior. Figure 1 shows the hypothetical results of these different approaches: Portfolio A: 70% equities and 30% fixed income, steady over the entire period. Portfolio B: Equity allocation reduction and an increase in fixed income/bonds in equity outflow periods, and vice versa during equity inflow periods. Portfolio C: Pursuing Portfolio B's tactical rebalancing strategy, but this time adding or taking away cash in lieu of fixed income/bonds. Portfolio A: Static 70% equities, 30% fixed income – no changes in strategy or allocations. Following a 1-month period of equity outflows, lower equity allocation in increments of 10%, and raise fixedincome allocation in increments of 10% to 20% in equities and 80% in fixed income/bonds. Following a 3-month period of equity inflows, raise equity allocation in increments of 10%, and lower fixedincome allocation in increments of 10% until 70% in equities and 30% in fixed income/bonds is reached. Portfolio C: Start with a portfolio comprising 70% equities and 30% fixed income, and adjust it according to what was done with Portfolio B, but this time with reallocation in and out of cash instead of fixed income/ bonds. Important Note: In this illustration, we waited longer to increase the equity allocation during inflows than to decrease the equity allocation during outflows, because we believe that investors tend to be more reactive to outflows than inflows (fear vs. greed). Over the period in question, equity allocation reduction could bolster short-term performance. Yet in the long term, if investors attempted to time the market through the sales of their equities and the conversion of their portfolios to cash or fixed income, their portfolio performances would fall well short of 70% / 30%. In this illustration, over the complete 24 years, Portfolio A surpassed Portfolio B by 210% and outdid Portfolio C by 321%. Note: Before the 2008 recession, equity flows negated, subsequently reducing equity allocations in Portfolios B and C, helping them to outshine Portfolio A for a brief period. Portfolio B eclipsed Portfolio C, because fixed income made greater returns than cash, benefiting from consistent capital gains as interest rates went down (Remember: As rates fall, bond prices rise, and vice versa). The "net, net," as they say, is: Stick with your personalized plan, and be disciplined and not "moved to act" based on fear, greed or emotion. A steady hand is best served when investing, and this is why investors work with advisors. As your investment advisor, we help you understand your risk tolerance. Getting clients to understand the potential drawdown scenarios and being OK with it allows you to understand the potential impact of a correction and if you are prepared to weather the storm. Can you live with a 5, 10, or even 15% drawdown and not have it disrupt your life? At WT Wealth Management we have software that can show you potential drawdown events on your portfolio. Illustrating real life events via our stress testing software lets you see actual numbers in order to insure we are delivering risks within your comfort level. We are not saying 2008-2009 was fun, or that there weren't things that we could do to make returns – or, in this case, losses – more palatable. But keep in mind… If you find yourself in a riptide of a market sell-off, it's probably already too late to react and make a decision. The best approach is to have a plan, know the consequences, and then just ride out the storm. WT Wealth Management is a Scottsdale-based Registered Investment Advisor with over $100 million in client assets under management. We strive to help investors of all shapes and sizes reach their individualized goals. Jacobson, Nanette Abuhof. 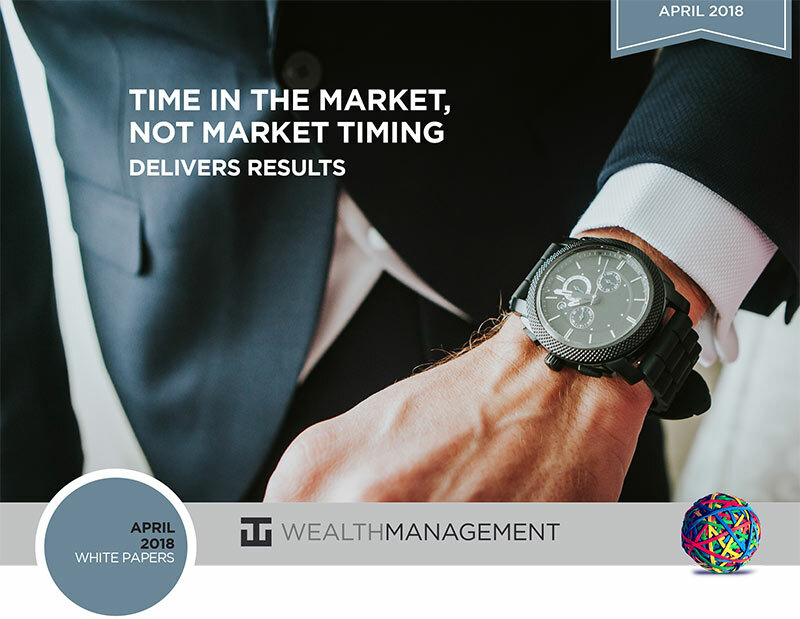 "Market Time, Not Market Timing, Has Led to Better Results." Hartford Funds, March 2018. WT Wealth Management is an SEC registered investment adviser, with in excess of $100 million in assets under management (AUM) with offices in Flagstaff, Scottsdale and Sedona, AZ along with Jackson, WY and Las Vegas, NV. WT Wealth Management is a manager of Separately Managed Accounts (SMA's). With an SMA's performance can vary widely from investor to investor as each portfolio is individually constructed and managed. Asset allocation weightings are determined based on a wide array of economic and market conditions the day the funds are invested. In an SMA you may own individual Exchange Traded Funds (ETF's), individual equities and mutual funds. As the manager we have the freedom and flexibility to tailor the portfolio to address your personal risk tolerance and investment objectives – thus making your account “separate” and distinct from all others we managed. Any opinions expressed are the opinions of WT Wealth Management and its associates only. Information offered within these white papers is neither an offer to buy or sell securities nor should it be interpreted as personal financial advice. You should always seek out the advice of a qualified investment professional before deciding to invest. Investing in stocks, bonds, mutual funds and ETF's carry certain specific risks and part or all of your account value can be lost. In addition to the normal risks associated with investing, narrowly focused investments, investments in smaller companies, sector and/or thematic ETF's and investments in single countries typically exhibit higher volatility. International, Emerging Market and Frontier Market ETF's, mutual funds and individual securities may involve risk of capital loss from unfavorable fluctuations in currency values, from differences in generally accepted accounting principles or from economic or political instability that other nation's experience. Individual bonds, bond mutual funds and bond ETF's will decrease in value as interest rates rise. A portion of a municipal bond fund's income may be subject to federal or state income taxes or the alternative minimum tax. Capital gains (short and long-term), if any, are subject to capital gains tax. At WT Wealth Management we strongly suggest having a personal financial plan in place before making any investment decisions including understanding your personal risk tolerance and having clearly outlined investment objectives and a clearly defined investment, time horizon. WT Wealth Management may only transact business in those states in which it is registered, or qualifies for an exemption or exclusion from registration requirements. Individualized responses to persons that involve either the effecting of transactions in securities, or the rendering of personalized investment advice for compensation, will not be made without registration or exemption. WT Wealth Managements web site is limited to the dissemination of general information pertaining to its advisory services, together with access to additional investment-related information, publications, and links. Accordingly, the publication of WT Wealth Management's website should not be construed by any consumer and/or prospective client as WT Wealth Management's solicitation to effect, or attempt to effect transactions in securities, or the rendering of personalized investment advice for compensation, over the Internet. Any subsequent, direct communication by WT Wealth Management with a prospective client shall be conducted by a representative that is either registered or qualifies for an exemption or exclusion from registration in the state where the prospective client resides. For information pertaining to the registration status of WT Wealth Management, please contact the state securities regulators for those states in which WT Wealth Management maintains a registration filing. A copy of WT Wealth Management's current written disclosure statement discussing WT Wealth Management's business operations, services, and fees is available at the SEC's investment adviser public information website – www.adviserinfo.sec.gov or from WT Wealth Management upon written request. WT Wealth Management does not make any representations or warranties as to the accuracy, timeliness, suitability, completeness, or relevance of any information prepared by any unaffiliated third party, whether linked to WT Wealth Management's web site or incorporated herein, and takes no responsibility therefor. All such information is provided solely for convenience purposes only and all users thereof should be guided accordingly.